"That time of the month..ehem." We all deal with PMS in different ways, personally, i try and believe i'm not affected by it at all...but if you asked my boyfriend & close family i'm sure they wouldn't agree with me. Please be as creative as possible, make me laugh, make me cry...it's totally up to you. I will be judging the answers and the best one will win a girly dvd, some chocolates, bath salts etc..the perfect pampering kit! Everything you need to boost you're confidence. This contest is UK only i'm affraid girlies (But for those of you in the US, have no fear as i will be holding my own contest very soon) & it will be closed on October the 12th at 6pm. 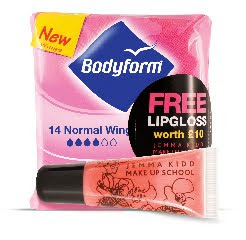 Another thing i want to mention is that Bodyform are collaborating with Jemma Kidd & as of the 12th October for a limited time, you can buy bodyform for around £1.50 with a free Jemma Kidd gloss worth £10. Besides the free lipgloss, bodyform will also be feauturing useful information on the "Eve Appeal" on it's packaging. Jemma is a long term supporter of the Eve Appeal, a charity which raises funds for research into gynaecological cancers. With Bodyform & Jemma Kidd both coming together with the Eve Appeal, it will raise awareness about gynaecological cancer & the symptoms. Please feel free to visit the Eve Appeal website for more information, i think this is a subject that definitely is not addressed as much as it should. I would also urge you to go to the bodyform website and take a look at another contest they are holding where you and a friend can win a chance to have a day at the Jemma Kidd school of makeup & take away a fabulous goody bag. This contest opens on the 12th October. I hope that you will get involved, i'm really excited to see your responses.